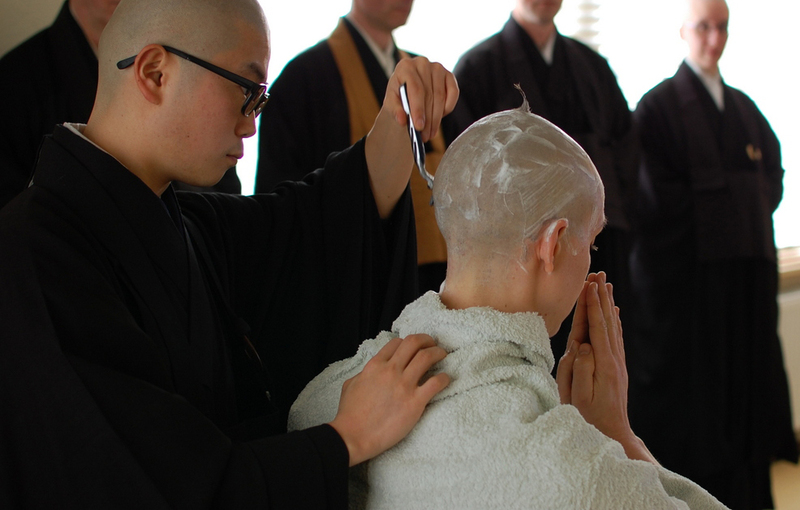 Monastic life is often seen as a withdrawal from the active world. But that may not necessarily be the case. I see it more as a lifestyle that allows for taking on responsibilities that can easily be overlooked yet are undeniably part of our human existence. While staying in Bhutan, somebody told me that in their culture everybody is considered to have both social and spiritual responsibilities. It’s just that for laypeople social responsibilities come first and spiritual responsibilities second, while for monks it is the other way around. Nowadays more and more people live in crowded cities, drive their kids to school, spend long hours in traffic jams, work in big office blocks, and frequent busy restaurants. It has almost become the norm for a so-called active life. In a stark contrast, I often see one of our neighbouring farmers driving a tractor over his fields for days on end – and sometimes even at night – all alone. Does that mean that he is withdrawing from society? Perhaps not really. He just has different responsibilities, like a researcher in the Amazon jungle or a crew member of a submarine. Similarly, the nuclear family has become normative for many people, as if other lifestyles would not really meet the criteria for a meaningful existence. But even not that long ago, family often meant a large extended family. And there have always been alternatives that don’t necessarily imply a married life. In many cultures, entering a monastery has been one of them. Joining the armed forces on long expeditions or signing up for a sailing vessel and being away for years were others. To some extent, this is still the case. Certain occupations just require other types of social commitment. Monastic life is for those who feel a calling to take major responsibility for our spiritual life. The heritage of the Dharma is so precious and profound that it needs at least a number of full-time guardians – just as in other fields of expertise, such as science, arts and crafts, or sports. Their dedication inspires those who, because of their other responsibilities, can only be partially involved and who inspire the monastics with fresh enthusiasm. In fact, the model of an “open monastery” where laypeople practice together with monastics may be a very appropriate model for the modern world. At Zen River, a small team of residents keep the flow of daily practice going, and everybody is welcome to join for any length of time. The monastery is a community that expands and contracts continuously, breathing in and out like a living organism. All participants take on specific roles, like different parts of a body, and together we serve the Buddhadharma – which in turn benefits each and every one of us. The community lifestyle gives our practice a real-life quality and also makes it economically feasible. What we have seen over time is that the fruits of meditation start to show in our environment. As things in our inner world fall more and more into place, so do our relationships with other people, the buildings and the garden, the design and the paraphernalia of the ritual spaces, the kitchen, the sewing studio, the office, the library, the tool shed, and the other spaces. It works like a spiral, and the effect extends far beyond the monastery. The beauty we find within ourselves gets expressed in the so-called outside world and this inspires again to delve deeper into our meditation. Ultimately, it is only a genuine, beautiful, and loving mind that can make this world more genuine, beautiful, and loving. But we have got to start somewhere, and monasteries can help us in taking on that responsibility. Monasteries are spiritual homes where the treasure of the Dharma has been preserved throughout the ages, where meditation, ritual, the scriptures, and codes of conduct can be addressed in a time-tested environment. In the West, we are still at a pioneering stage, but I hope that our efforts will give the Dharma more of a chance to survive, so that the next generations can bring it to fruition.